The suicide of a loved one is a devastating event that no one should have to suffer through. Unfortunately, suicide is the 10th leading cause of death in the United States. One person dies by suicide every 13 minutes. Suicide is an inescapable reality that knows no geographic boundaries. In fact, more than 800,000 individuals die by suicide worldwide every year, according to a World Health Organization report. The WHO partnered with the International Association for Suicide Prevention to designate Sept. 10 as World Suicide Prevention Day, so that all who have been touched by suicide can support prevention, commemorate the victims and comfort their loved ones. Because of the social stigma surrounding suicide, people who are mourning their lost loved ones may not know how to express their grief. Their friends may not know how to comfort them. Grief is not a distinct series of steps or an illness with a predictable prognosis, despite what popular culture might claim. Everyone grieves differently. Some people might feel anger toward the deceased, whereas other people may not express any powerful emotions. Some people experience their grief in sudden bursts. Try not to judge a person for how he or she grieves. These kinds of clichés can be extremely painful for a suicide survivor. If you cannot think of something to say that is not a cliché, simply remain present and silent. Don’t disappear because you’re afraid you will say the wrong thing. Sometimes, a simple, “I’m sorry for your loss,” and shoulder to lean on are enough. Suicide is a particularly complicated form of death to grieve, since society often puts the blame on the victim. Although suicide can seem like a conscious choice, it is instead the end stage of a disease that severely disrupts brain function. You might be tempted to call the deceased “selfish” or “crazy.” Don’t. You should also avoid speculating about the cause or the trigger of the suicide. This can be very painful for the person who is grieving. 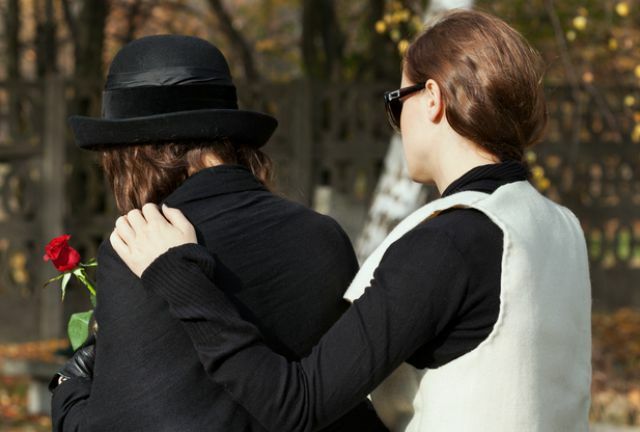 Because everyone grieves differently, some people may want to be constantly surrounded by other people during the grief process, while other people might withdraw or avoid interactions. Never force them out of their comfort zone while they are dealing with a traumatic event. If people wish to be left alone, let them know you are ready to listen if – or when – they want to share their thoughts and feelings. Suicide survivors often have a difficult time during special occasions such as holidays and birthdays. They may also struggle with the date of the death; for example, if the person died on Feb. 18, they may have trouble on March 18, April 18 or even Sept. 18. Even though the pain fades with years, grief never really goes away, especially on difficult dates. Keep your phone handy. Check in on the person after the funeral is over and the sympathy flowers have stopped arriving. Let the person vent. The best thing to do for people who are grieving the suicide of a loved one is to listen. Sovereign Health Group’s mental health treatment program provides patients with non-judgmental, compassionate, confidential care for a variety of mental illnesses including depression, anxiety, post-traumatic stress disorder, schizophrenia, bipolar disorder and other mental and behavioral health disorders. For more information, please contact 888-530-4614.